Open the podcast app (it’s a purple image of a microphone). If you don’t see the app, just download it from the App store. It’s free. 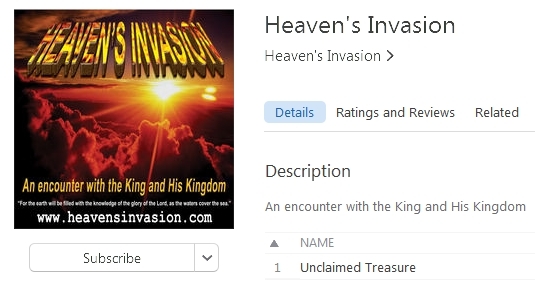 Once you’re in the podcast app, search the Store by typing into the window: “Heaven’s Invasion podcast” and tap the search icon. You’ll see all our podcast episodes. Under “Podcasts” at the bottom, you’ll see the “Heaven’s Invasion” image for our Podcast. Tap it. You’ll then see a purple “Subscribe” button on the right. Click it and you’re done. To download our previous episodes, just click the download icon to the right of each podcast. If you don’t have iTunes on your computer or smart device, it’s free to download and install. Here’s the download link. Click the blue “View in iTunes” button just below our image and it will launch iTunes.